In 1998, Christian Action (CA) became involved with programs for orphans and abandoned children by co-managing Qinghai Province’s first children's home with the Civil Affairs Bureau in Xining, the provincial capital. We have cared for over 400 children in the Xining Children’s Home, which is designed and equipped specifically for their needs. Nearly 90% of our children suffer from some sort of physical or mental disability. At the home, we provide children and youth with a rehabilitation program and special education led by experienced therapists. We believe that the earlier these disabled children receive such treatment, the more independent they can become in life. When necessary, Christian Action also raises funds and arranges for specialized medical treatment, reconstructive and life-saving surgeries. In order to better serve the children, CA facilitates overseas adoptions to date 189 children have begun new lives with their "forever families" in the US, Spain, Finland, Sweden, Canada and the Netherlands. CA also places children and youth with loving foster families, for whom we also provide support. Foster care has proved to be richly rewarding for the children and their new families, as well as vital for the community as the public is beginning to understand the value and needs of children with disabilities. CA also oversees four small group homes that provide a family-like environment for a variety of age groups. Christian Action has served disabled children at the Xining Children’s Home for 18 years now, and the experience has been invaluable as we work to promote their acceptance and rights in Qinghai. Despite the unusually high rate of birth defects, no resources were previously available to help parents deal with their child’s mental or physical disabilities. We were thrilled when funds became available for a children's rehabilitation center - the first ever in the province, which the government invited us to help set up and run! In October 2007, the Xining Children's Rehabilitation Center was opened to serve special needs children from the Xining Children's Home and the local community. Because this was a brand new field for the locals, we brought together a team of Hong Kong-based professionals to assist local builders and staff with designing and equipping the center. Occupational and physical therapists, special education teachers and social workers were also brought in to work with the children and to train local families and staff. The latter group will eventually run the centre once they are fully qualified. The Center has won numerous national awards — but, more importantly, special needs children and their parents are learning life-changing skills and don’t feel as isolated as they once did. It is our goal that by increasing independence for the disabled, supporting their families, educating the public and encouraging their acceptance of the disabled, these children will no longer be abandoned. Qinghai Province averages 9,000 feet in altitude. Air is thin and winters are fierce. The Tibetan Plateau, which comprises most of Qinghai Province, is vital to the rest of China and much of Asia since it's the source of three major rivers - the Yangtze, Yellow and Mekong. Thus, Qinghai is nicknamed "The Water Tower of Asia." While China residents downstream from Qinghai enjoy its life-supporting waters, newborn babies on the Plateau suffer an unusually high congenital disability rate. When combined with poverty and other factors, babies and infants are abandoned at a sadly high level . Christian Action began partnering with the People’s Republic of China to rescue and love Qinghai’s orphans and poor in 1997 when the province was particularly underdeveloped. When CA first began serving in Qinghai, orphans and abandoned infants were often left unattended and shared quarters with the elderly and psychiatric patients in the same government building. There was no training for parents of disabled children in the community and government employees in the Children's Home and very limited foster care. Special education and opportunities for therapy for disabled children were nonexistent. The situation seemed hopeless. Over the last 18 years so much has changed. Christian Action now teams with the government to run 5 children's homes located in Xining, Huangnan, Haixi, Guoluo and Hainan prefectures, serving nearly 800 orphaned and abandoned children and youth (many are severely disabled). In 2014, the Chinese government once again invited Christian Action to help address a great need: The care and development of mildly and severely disabled youth who, when they turn 18, have to leave the Xining Children's Home (XNCH) and transition to Xining Social Welfare Institute (XNSWI). CA and the Qinghai government signed a partnering agreement for the start-up of a model program--The Bridging Program--to help young people who have missed out on adoption or foster care and will require full-time care for the rest of their lives. A new Small Group Home and sheltered workshop is being established at XNSWI for those making the transition from XNCH. Mentoring of each person's health and well-being will be vastly improved. Ongoing training and development for our youth who are entering adulthood will also be provided. The Bridging Program is a huge answer to a long-standing prayer because this groundbreaking project will bring about powerful reform and facilitate help for those who have been neglected, or even forgotten, for such a long time. The small group home at XNSWI is among the first of its kind in China! In addition to its work with orphans, Christian Action has also built 463 homes for poor ethnic Tibetan families, ten schools and two clinics at high altitude on the Tibetan Plateau. As a result of the trust gained working with the government over the years, CA has been invited to co-manage 3 more children’s homes throughout Qinghai, including the area of Yushu, which suffered a devastating earthquake in April 2010. The goal is that there will be a home in each of Qinghai’s eight prefectures. Because there was so much damage done by the earthquake (when 100,000 people were made homeless and 80% of all structures were demolished), the government is still evaluating the merits of building anywhere from one to three homes in Yushu. Christian Action is not only being positioned to save and serve over 2,000 orphans (primarily Tibetan) in a total of 8 homes throughout Qinghai Province, but it also is becoming the model for holistic care across the country. The government has responded to CA’s request and example by providing a better environment for children and youth including group homes, medical rooms, rehabilitation facilities, special education training, computer rooms, and outdoor physical activity facilities. CA believes that wherever possible children need to be reunited with their families or cared for by loving families in the community. The foster care service CA has helped to implement in Xining has also become a model for the rest of China. A training program for parents of disabled children is now in place in Xining. Siew Mei and her team have been invited to Beijing to explain and help train representatives from many other cities in these areas. Approximately half of Qinghai's population are Tibetan, Mongolian, Salar, Hui, or Tu ethnic minorities, and are either farmers or semi-nomadic herders. Most of them live well below the UN Absolute Poverty Line with little prospect for a better future. On the oxygen-thin high altitude grasslands, where elevation averages over 3,000 meters above sea level and the weather is extremely harsh, their homes are tents made of yak hair. 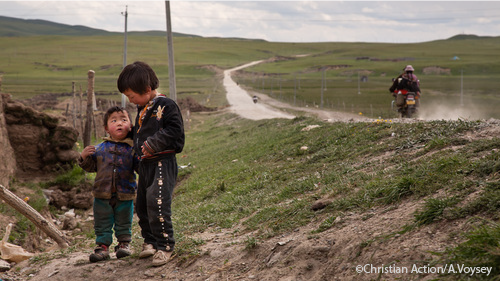 In 1997, the Qinghai Poverty Alleviation Office asked Christian Action to help this beleaguered population. Basic education is arguably one of the most effective tools for alleviating poverty and improving livelihoods. Yet in Qinghai, nomadic herdsmen live scattered in the vast tracks of land; for their children, attending school would often mean hours of walking each way. Now, however, children in one prefecture finally have easy access to schools — and an education. Christian Action has built six primary schools since 2000, in the desolate Huangnan Tibetan Autonomous Prefecture. All the schools are now full of eager students. Two schools are already in desperate need of more classrooms and are seeking funds for extensions. It is a privilege to offer education to the poor families of this region who never dreamt their children would have the opportunity to break the cycle of poverty. To help students to complete their studies, CA has offered scholarships that cover school fees, boarding fees, and teaching materials. CA has set up scholarships to encourage students to reach tertiary-level or university standard in HuangNan Children’s Home and in the Zeku area. Students who have residence identity, qualified admission to college or university, and proof of financial difficulty, can apply for the scholarship. CA gives priority to orphans, poverty-stricken families, or families whose members are either disabled or suffer long-term serious illness. Since 2008, 1838 education grants have been provided! In addition to providing financial assistance, we also teach the value of sharing with, and contributing to society. Students are being inspired through the CA education grant programs to give however they can, such as doing volunteer work. 2019 Christian Action Asia is a US tax-exempt 501(c)(3) organization. © 2019 Christian Action Asia. All Rights Reserved.